Now we're going to get "spicy"! 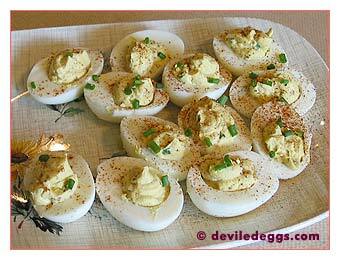 After all, the name "deviled eggs " suggests the result should at least be a little bit on the naughty side! This recipe raises the heat with the addition of hot sauce. Spiciness is a personal preference, so I'll start you off with a suggestion and you can turn the heat up or down as you enjoy! You'll find the heat quotient mild to medium with this recipe.